We’re excited to announce our 2019 summer camps! we'll see you this summer! Camp Full! Please register on Wait List below. Come play at Tinker! 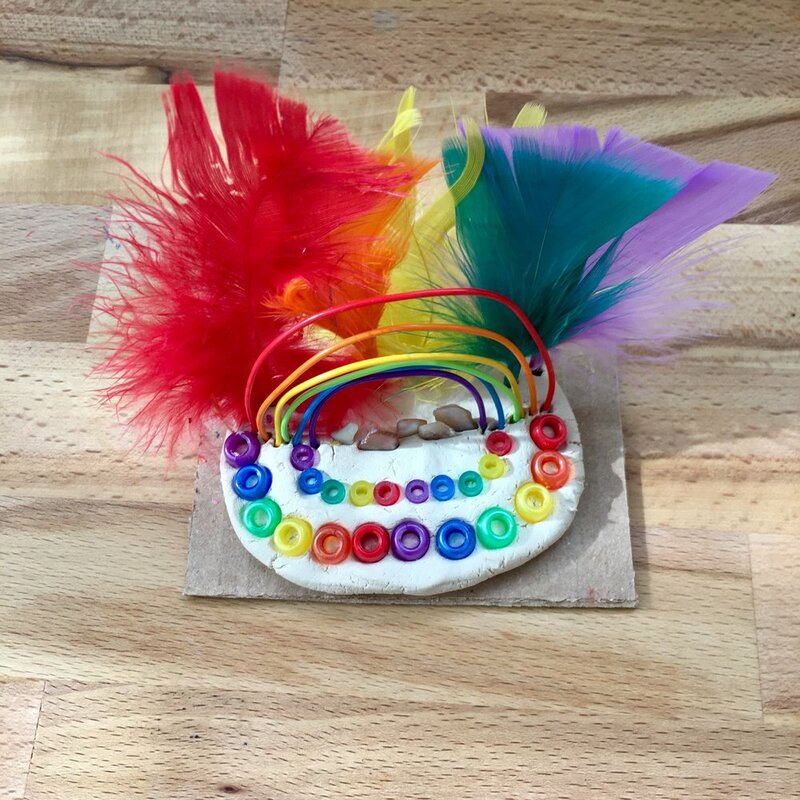 During this fun week for our youngest tinkerers, we'll explore sensory materials, create, paint, and play the morning away! Make + Play will be 1 part art and 1 part play for the perfect week of summer camp. *Children must have turned 3 by January 1, 2019. Please read our FAQ for more information. Our Fairy Keepers Camp is back by very popular demand! Come on a journey with us this week as we explore the magical, beautiful, and exciting world of fairies! We'll build fairy houses for special fairies to live, and plant fairy gardens to make sure they have a place to frolic and play! We'll use our imaginations, play, and create plenty of fairy-related art during this fun week of exploration and creation together with other fairy lovers! This summer, we’re bringing back two of our most popular camps in a stellar combination of Toys & Games! Making marble mazes, straw rocket launchers, spinners, and much more, campers will become Master Toy & Game Makers. This exciting camp week combines art, creative problem solving, and imagination all while creating! 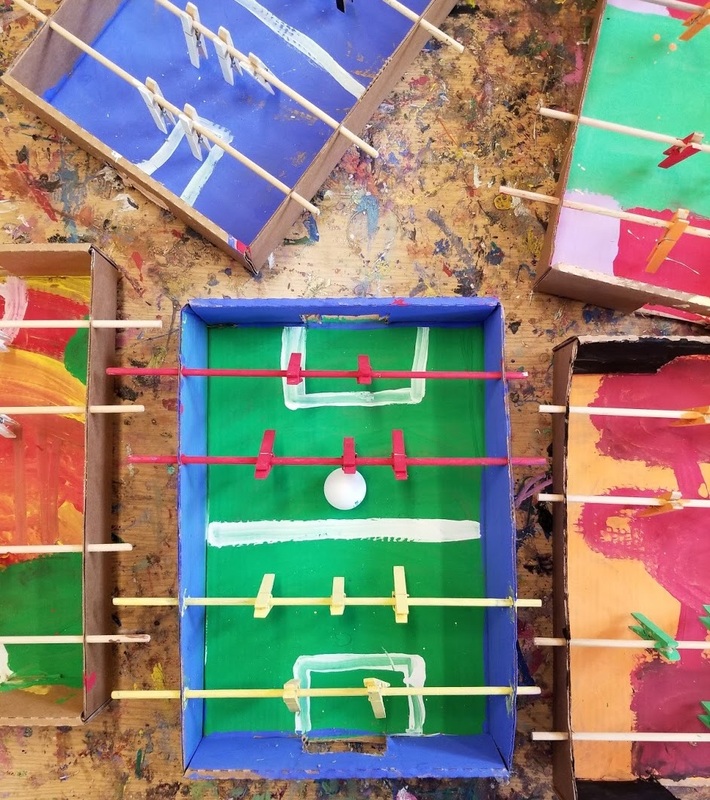 Students will also have the chance to invent their own games this week using the wide range of materials available in the studio before bringing their toys and games home to keep playing with friends long after camp ends. Using a variety of mediums, children will enjoy transporting themselves to a magical world Under the Sea! We'll use clay, collage, learn new painting techniques to make underwater scenes and animals, and even transform our studio into an underwater oasis. Calling all scuba divers! Learn a unique form of storytelling during this fun Comics Camp! Comics lend themselves to creative thinking, playfulness and imagination. In this camp we will learn about use of text, breaking up a story, and the linear style of comics. 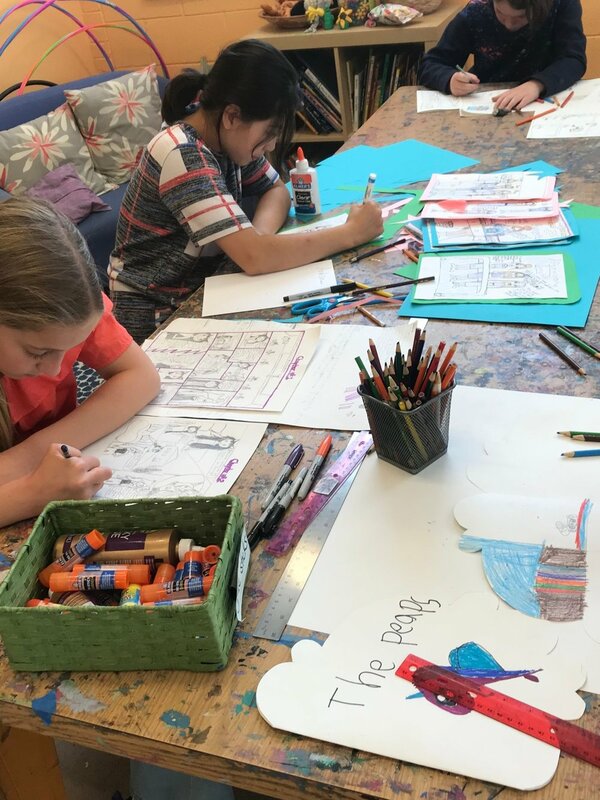 Students will explore the individual elements used in comics such as how to draw different types of characters, show emotions, and more before creating a complete comic of their own. Don't miss this fun week of camp! Curtain call! Join us for a magical week of puppet making, set building, storytelling, and play producing! Using a variety of mediums, campers will make finger puppets, marionette puppets, and shadow puppets. Campers will also build stages and scenes for their puppets, before writing scripts for their very own play! This will be a fantastic arts-integrated camp week. See you in the puppet studio! This course is for artists who are interested in the specific storytelling genre of comic books and graphic novels. Students will be supported and encouraged through writing their own story lines, designing their characters, and creating sequential art. We'll draw inspirations from classic examples from the genre and largely work in pen and ink. All levels welcome. Experience the magic of the pottery wheel! We'll spend the week learning the basics of wheel throwing and advancing our skills with techniques such as altering our wheel thrown artwork. Class size is limited to 6 students--allowing each student to work on their own pottery wheel and at their own level. NOTE: So that we can work on the wheels all 5 days, attendance at an additional afternoon Glaze Class back in the studio is required an in order to glaze all pieces made during camp. When registering for this camp, you must choose one of the following Glaze Classes to attend (limited spots available in each). Each Glaze Class is held from 4:30-6pm: 6/25, 7/11, 8/1, 8/8. Glaze Class is included in the price of this camp. PICK UP NOTE: All pieces will be fired in the kiln after glazing (with dinnerware safe glazes), and ready for pick up 2 weeks after your Glaze Class. We will be exploring how to draw people, animals, and nature using both traditional and contemporary drawing techniques with media such as pencils, pen and ink, charcoal, and more. Building upon various realistic drawing techniques, this camp will culminate in an independent project of each student's choosing. Now let’s get drawing! This week will be full of water, soap and suds, as we felt wool roving into story mats and play scenes! We’ll also use felt sheets to build scenes and features (like trees and mountains), and loose parts and other media to add even more interest and excitement. This week has it all: messy art making, painting, creating, building, storytelling, and plenty of imaginative play. Join us for Felting Stories! This course is for artists who are interested in increasing their skill in rendering people realistically. 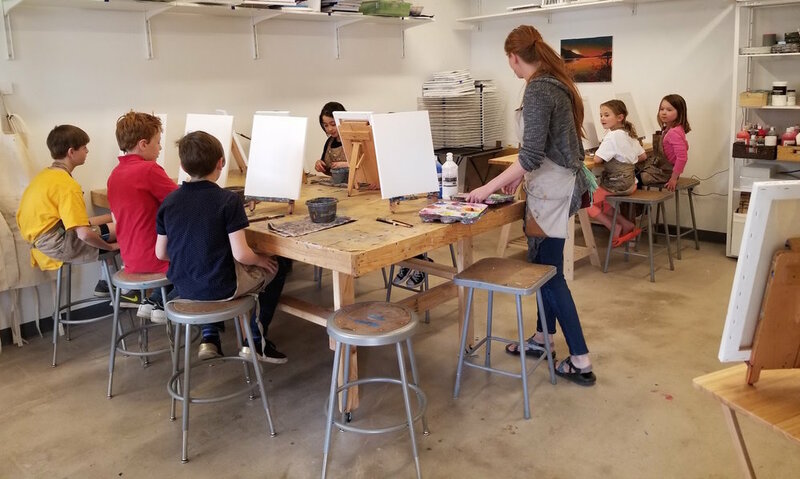 We will study the bone and muscular structure, and how they inform the features of the human body that are most challenging to draw and paint (including hands, feet, and faces) before working with a model in a clothed figure drawing session. We will work with a variety of 2-d mediums and projects will reflect a new knowledge of the anatomical structures. All levels welcome. Learn the basics of wheel throwing, or advance your skills on the pottery wheel. 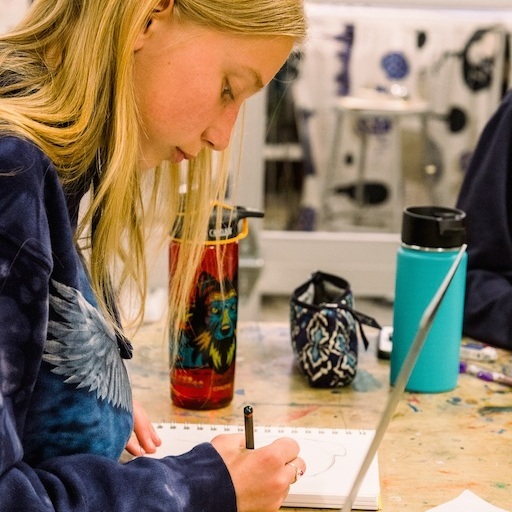 In this camp for ages 12-16, we’ll learn about centering, creating a variety of forms, and techniques such as altering our wheel thrown artwork. Class size is limited to 6 students--allowing each student to work on their own pottery wheel and at their own pace. All levels welcome. Build a foundation in painting with both acrylics and watercolor during this fun camp. Working on watercolor paper, canvas panels, and 12"x16" canvases, students will learn painting techniques, color theory, composition, and more in the diverse media of acrylics and watercolors. The week will culminate in an independent study painting of each student's choice. Now let’s paint! Build a foundation or advance your painting skills with the diverse media of acrylics during this camp. Working on paper, canvas panels, and 12x16” or 16x20” canvases, students will learn about color theory, mixing, layering, brush stroke, and compositions. After creating a variety of paintings, our camp week culminates in an independent study painting of each student's choice. All levels welcome. Printmaking is one of our very favorite mediums! The advent of the printing press changed the world - join us this week and it might change your art-making life forever too! Children will make their own stamps and printing plates to print images on paper, fabric and other surfaces. We'll explore mono-printing, block printing, and combining printing with other media to make unique pieces of art. With printmaking, the possibilities to create are truly endless! Let’s make instruments! We’ll use a variety of both traditional and interesting media this week to make instruments like ocarinas (clay whistles), rain sticks, shakers, and even kazoos! Take home all of your amazing new instruments at the end of the week, and invite friends to your jam sessions! Calling all pet lovers! Join us for a full week of making art about and FOR your pets! (Art making for dream or real pets welcome.) We’ll make, fire and glaze a clay water bowl, design bandanas for the most fashionable pets in town, and even paint your own pet portrait with acrylics on canvas. We absolutely can’t wait for this week dedicated to the love of furry, and not-so-furry, friends! From story books to greeting cards to cookbooks, opportunities for illustrative projects surround us in our daily lives, and we'll use them to help inform our projects. If you're an artist interested in the different ways the written word can intersect with your art, this camp is for you! All levels welcome. NOTE: So that we can work on the wheels all 5 days, attendance at an additional afternoon Glaze Class back in the studio is required an in order to glaze all pieces made during camp. When registering for this camp, you must choose one of the following Glaze Classes to attend (limited spots available in each). Each Glaze Class is held from 4:30-6pm: 7/11, 8/1, 8/8. Glaze Class is included in the price of this camp. Tinker is closed this week. Happy 4th of July! Students will learn about famous artists by "trying on" their techniques in this fun camp. We'll use many types of media including fabric, paint, and clay to explore artists from a range of movements over time as well as contemporary artists. This is sure to be an awesome week of art and learning! Wearable art is some of our very favorite kind of art to make! In this camp, we will learn to make our own metal, leather, and ceramic jewelry. 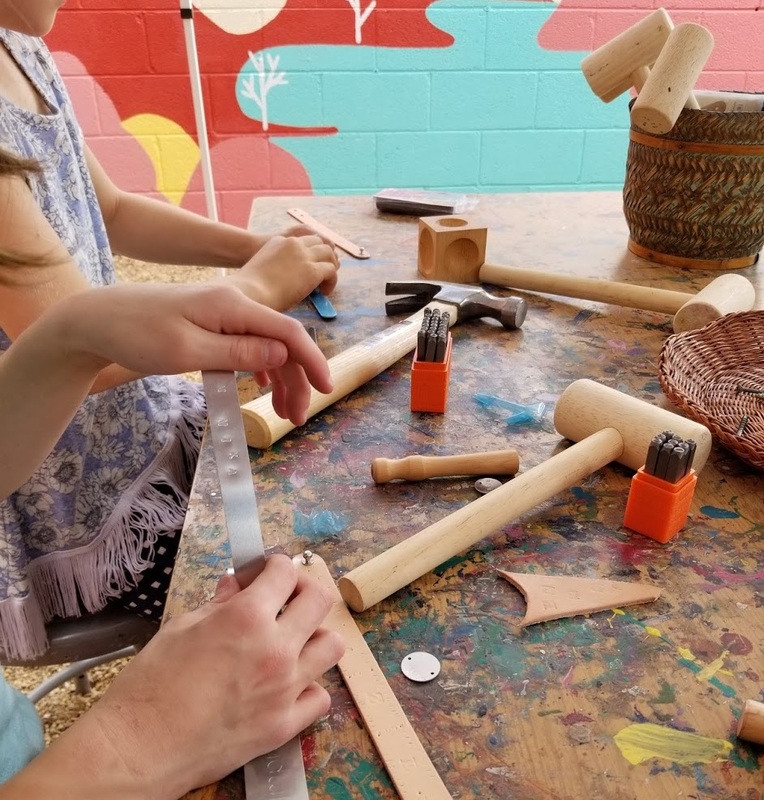 Using hammers and stamps, campers will create hand stamped metal and leather jewelry, make beads and pendants out of clay, and of course string all of our pieces with a wide variety of embellishment options like leather cords, metal chains, wooden beads, and much more. You’ll leave with a whole new set of new jewelry pieces ready to adorn your favorite outfits or gift to friends! 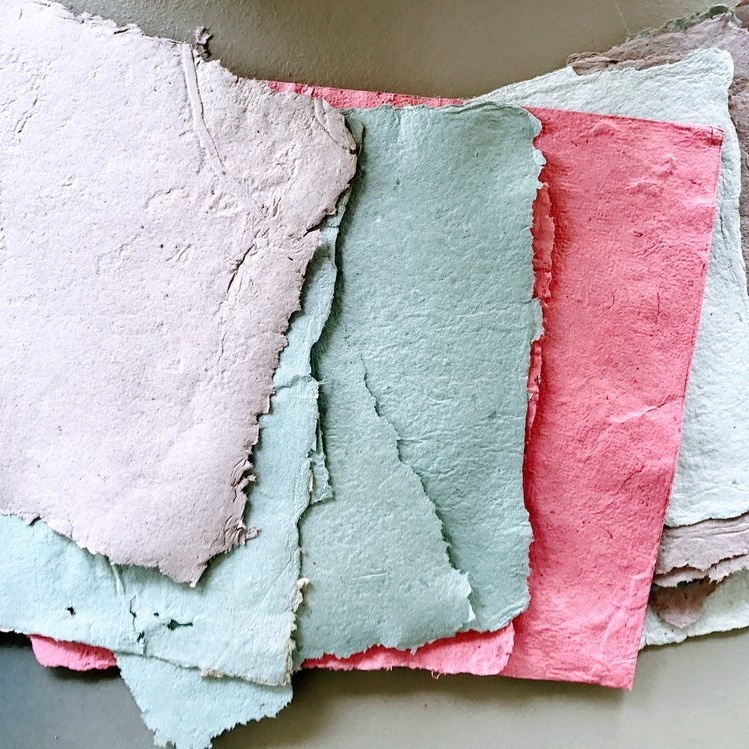 Join us for a fun, messy, noisy week of blending and straining to make our own papers in a variety of colors, shapes, and textures. We’ll also try out adding embedded items like flower petals, leaves, and glitter to our handmade papers. We’ll use some of our papers along with traditional bookbinding techniques to create stunning journals, while also learning a variety of paper folding and bookmaking styles. Campers will leave with an array of books, papers, and the knowledge of how to make more. Play with clay all day! Join us for 5 whole days molding, attaching, building, and creating in clay. Ceramics is a fantastic medium for children to work in and experience the third dimension--exploring its properties and limits. 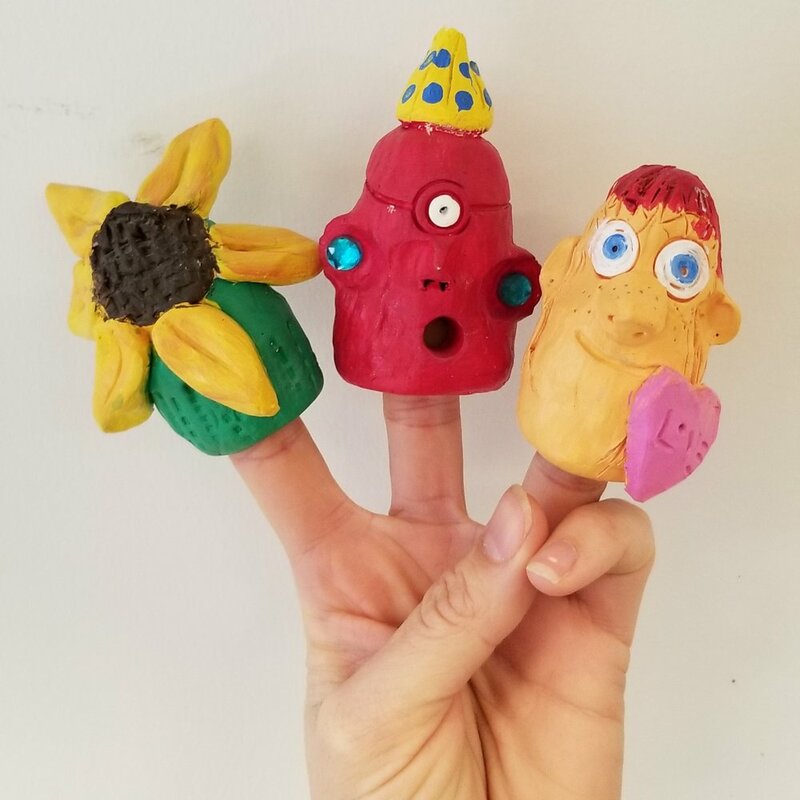 This camp will include the perfect balance of open-ended exploration in clay, alongside guided projects to support all artists in their creative clay endeavors! All pieces will be fired and painted or glazed with dinnerware safe glazes. For the artist who wants to bring their own interests, questions and ideas, while creating work in a supportive studio environment, this camp is for you! Students will start by choosing their medium(s) and enjoy a full week of self-directed projects, have the studio and materials at their disposal (note: no ceramics work this week), and enjoy both teacher and peer support and guidance as they build their own portfolio over our five days together. Please note that the successful student in The Independent Artist's Camp will be one who's motivated to create works of their own choosing. NOTE: So that we can work on the wheels all 5 days, attendance at an additional afternoon Glaze Class back in the studio is required an in order to glaze all pieces made during camp. When registering for this camp, you must choose one of the following Glaze Classes to attend (limited spots available in each). Each Glaze Class is held from 4:30-6pm: 8/1, 8/8. Glaze Class is included in the price of this camp. We'll be Tinkering Around all week long! 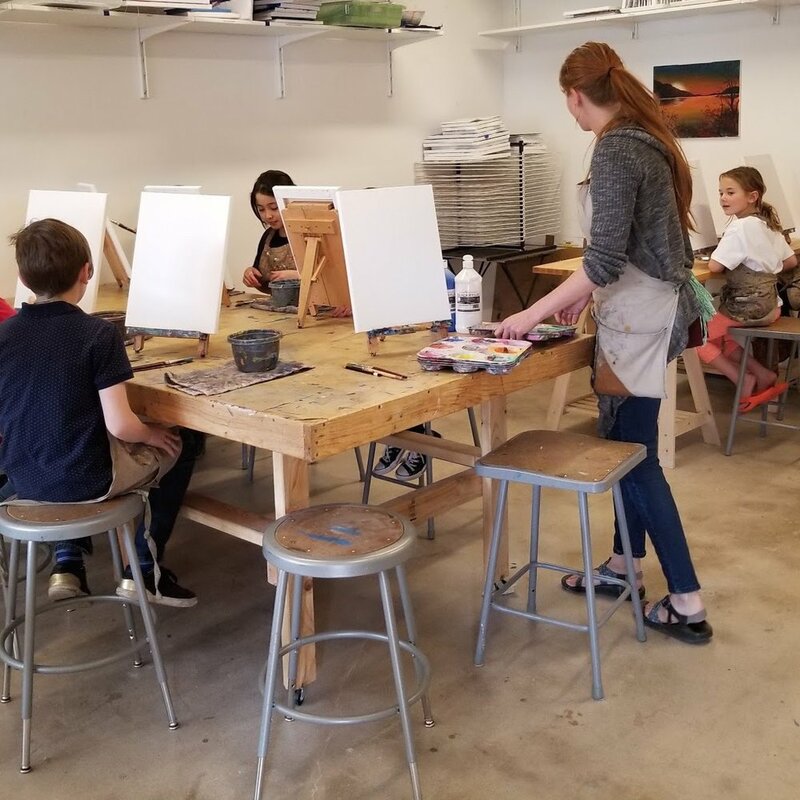 During this camp for young artists, campers will have the opportunity to explore a variety of mediums and art materials. 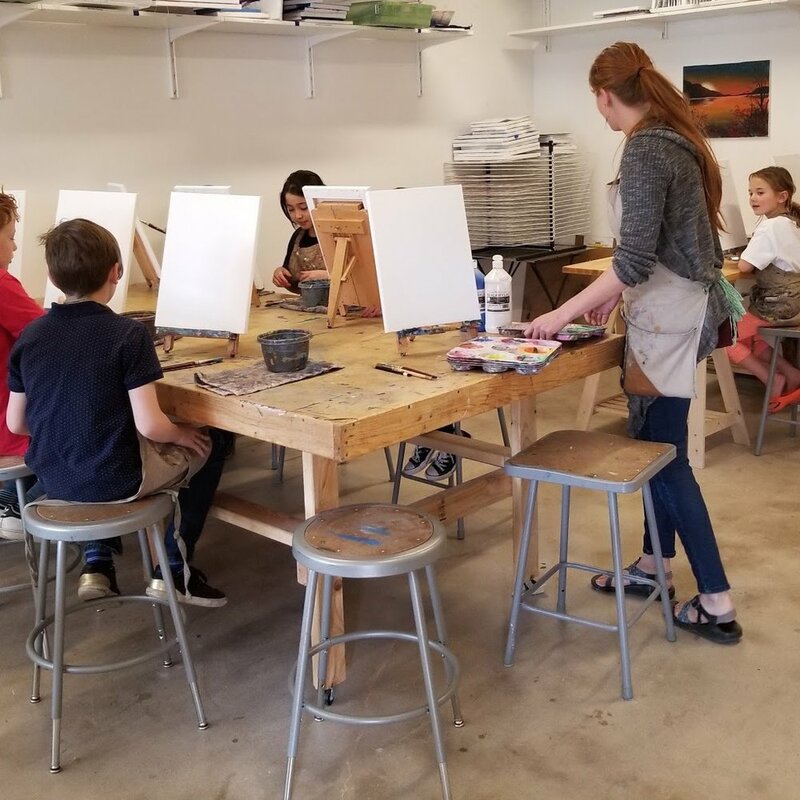 Young artists will enjoy working with clay, painting on canvas, and explore the fun of printmaking together. Enjoy your summer with this camp full of variety and creativity! 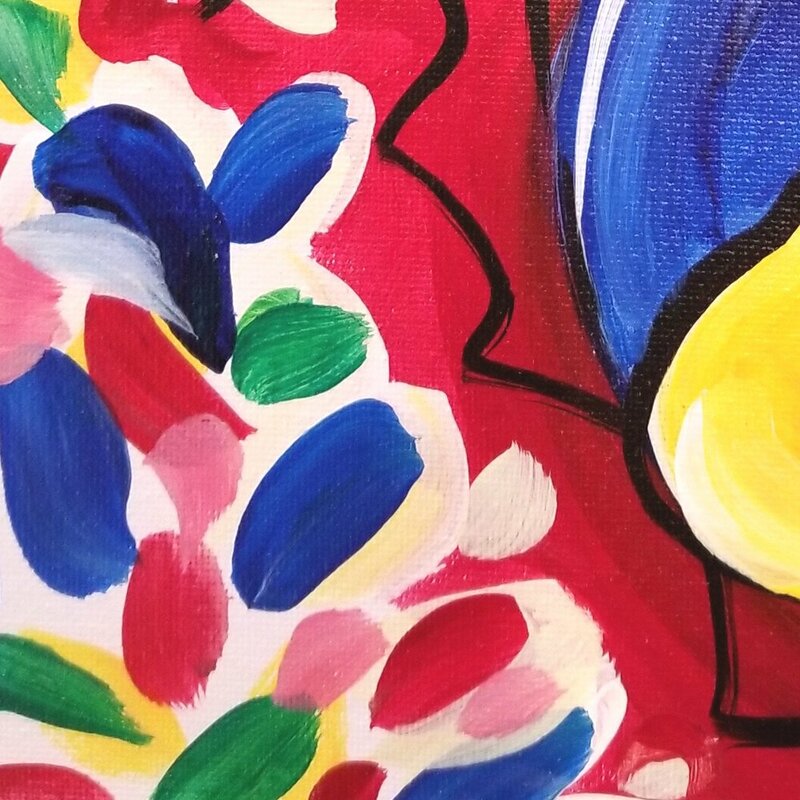 Explore abstract expressionism (think splatter painting style of Jackson Pollock and big blocks of color like Mark Rothko) in this exciting week of acrylic painting with a twist! 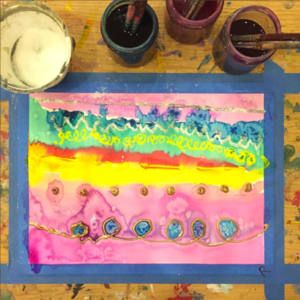 Incorporating other media along with acrylic painting on large pieces of fabric and canvas, campers will cut up their larger works as a base for creating collages, a series of mini-macro paintings, and more. This will be a very fun, active, week of painting, collaging, and making! Yup, you read that right. Each camper will get their very own train set (a 20 piece basic set of tracks and trains, compatible with other standard sets) and will build their own creative environments for their trains to run through! Each day will have a different theme, from underwater, to mountains and tunnels, to train stops in the city… student will learn building and construction techniques, and have access to our extensive buffet of supplies to add unique pieces and interesting materials to their train set scenes. At the end of the week, campers will take home their train set as well as their environments to continue playing long after camp ends. Don’t miss this awesome week of open ended construction and creative play! Let’s build! 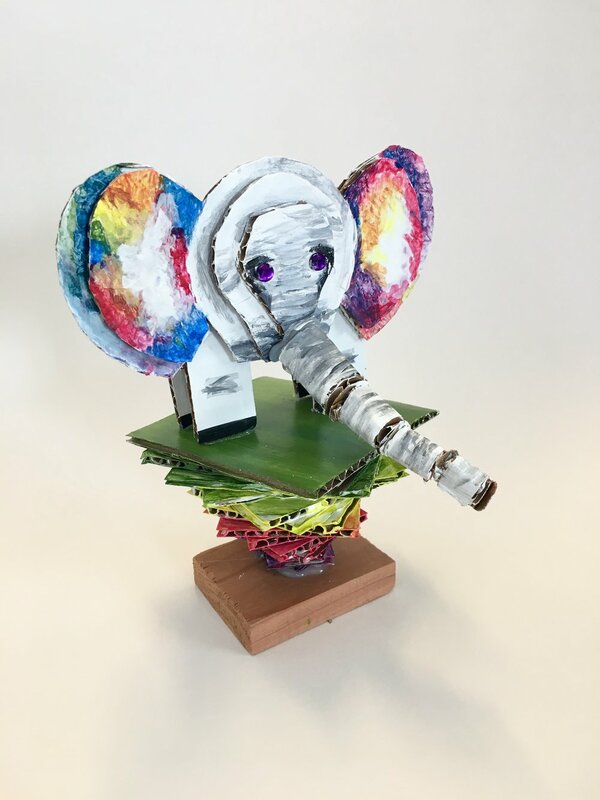 Using clay, wire, wood, metal and found objects, students will learn to construct, build, attach, and create awesome sculptures in this fun week of engineering and assembling. Campers will learn construction techniques including using a (low tem) glue gun and explore the nature of balance, weight, height, and both the possibilities and limits of sculptures in this engaging process-oriented camp week. Make your own stuffies from scratch! 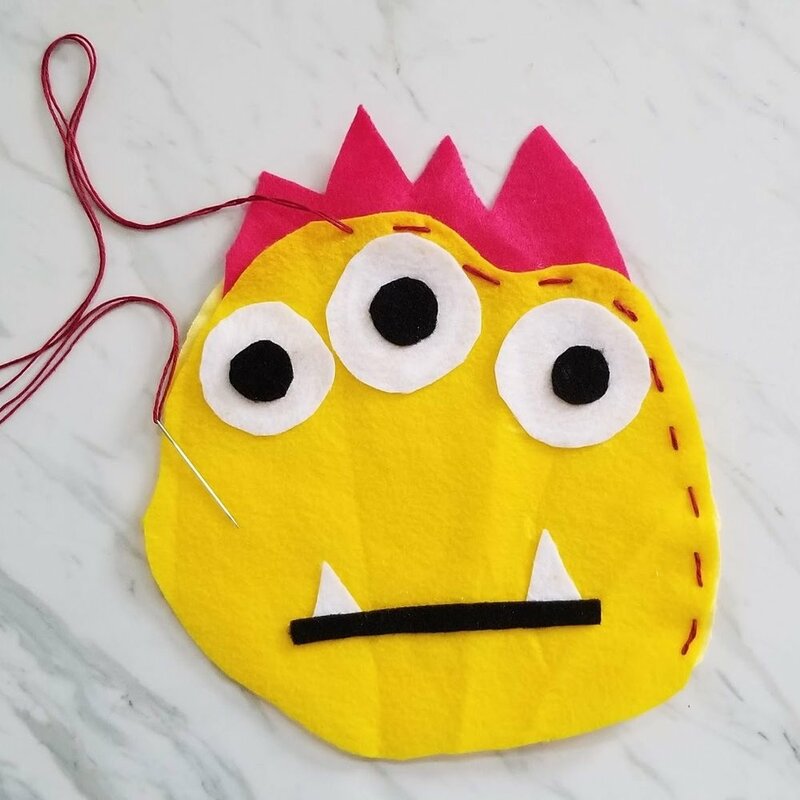 Using felt, fabric scissors, needle and thread, campers will learn to hand sew the perfect companions--their very own creatures, animals, and other stuffed softies! Felt Softies are a blast to make, fun to name, and are easy-to-take-care-of pets. Students will also enjoy embellishing their softies with our large assortment of fabric options, beads, yarn, and much more. Join us in the studio and learn to design, plan, sew, and create your very own collection of softies! 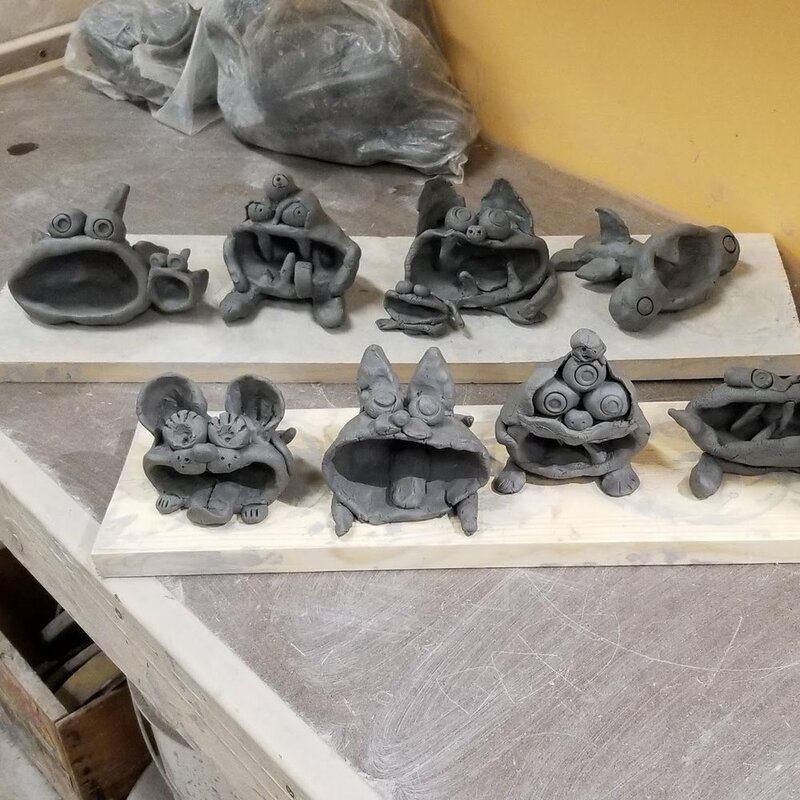 NOTE: So that we can work on the wheels all 5 days, attendance at an additional afternoon Glaze Class back in the studio is required an in order to glaze all pieces made during camp. When registering for this camp, you must choose one of the following Glaze Classes to attend (limited spots available). Each Glaze Class is held from 4:30-6pm: Thursday, August 8th. Glaze Class is included in the price of this camp. Let’s hang out! We’ll spend the week exploring the fascinating medium of mobiles and hanging artwork in the exciting week of camp. Taking inspiration from artists like Alexander Calder, we’ll play with motion and balance, weight and composition, as we use a variety of materials to explore this unique sculptural artform. Campers will have the opportunity to build, assemble, create, and explore throughout the week before going home with pieces ready to hang from ceilings and walls! Join us for a fantastic week of fibers, yarn, looms, and weavings. There’s a reason weaving is experiencing a fast growing resurgence--because it’s awesome! We can’t wait to share our massive yarn collection with campers who will learn to warp their looms, try a variety of weaving techniques, as well as use yarn to make poms, tassels, and unique wall hangings. Using a traditional wooden frame loom as well as cardboard looms and a large hula hoop loom, students will walk away with wall hangings, weavings, and even their own rug. For the new weaving enthusiast or the focused fiber artist ready to expand their skills, this camp will be a peaceful week of making among a community of artists. Missed Slime + Potions Camp last week, or maybe you love slime so much you’re back for more! Join us for two days of slime making and playing! 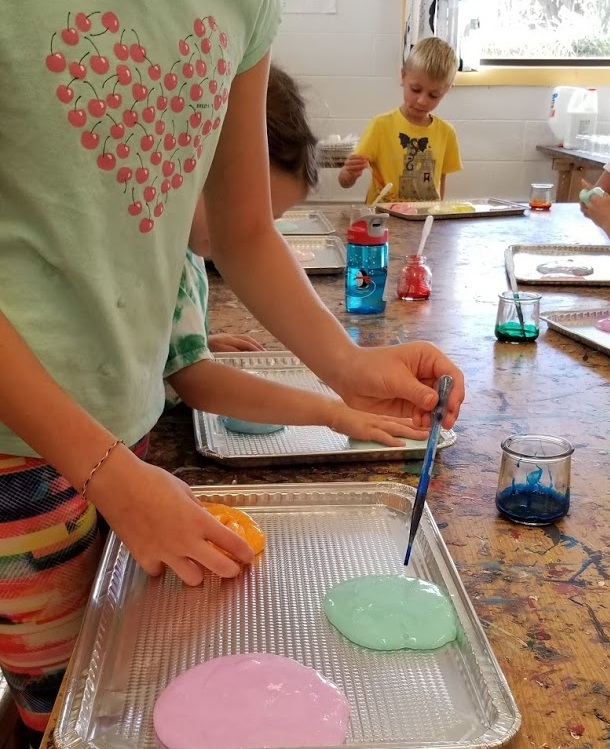 Campers can choose from our extensive buffet of slime additives, with things like googly eyes, floam beads, glitter, and every dye color in the rainbow. We’ll make giant slime bubbles, explore running slime over and through tools for interesting effects, before we name all our unique slimes and package them up in plastic containers to take home. Campers will also go home with a slime play containment device (a large tray) for continued play at home. Just 2 days left until school starts! Squeeze the most out of your final days of summer and join us for two days of canvas painting! Campers, ages 9 - 13, will paint a canvas each day—ready to take home and adorn your walls. Just 2 days left until school starts! Squeeze the most out of your final days of summer and join us for two days of canvas painting! Campers, ages 5 - 8, will paint a canvas each day—ready to take home and adorn your walls. Payment is due in full at time of registration. Your registration includes a $50 non-refundable deposit, per camp. In the event of a cancellation, the remainder of your payment (-$50 non-refundable deposit) will be refunded up to 14 days prior to the start of the camp. Within 14 days of the camp start date, your payment is non-refundable. A minimum of 5 students must be enrolled in order for camp to be held. We will notify you if your camp might not run due to low enrollment.